That is right - shooting stars are the proper way to go. Everything we associate with triumph is here. 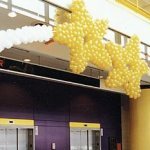 The "original" idea of this balloon sculpture is golden stars and white smoke, it looks wonderful. Many people, though, took different directions, using colors of their theme for the stars and even for the smoke. The main objective when the balloon sculpture is created is instant recognition. If the guest has to stop and think for some time - what is it? - the job is not done. So if the coloration of the star and the smoke makes it less recognizable - I would not recommend it. But... it is even more important that the client gets exactly what he wants, so we have done a white, red and blue smoke, and, if you want a green one - you will get it! The biggest shooting stars were made for the grand opening of MCI Arena in Washington DC, for the entrance. This is my personal passion. I am in the area of balloon decorations, because years ago I "accidently" made the first one and loved it! The idea behind the big sculptures (as well as behind the name of our company!) is very simple: anybody who enters the room and sees the decor must say "WOW! ", but not just say. He must fill it, literally. The very purpose of special events, especially in business, is to produce long lasting impression and good memories. The big balloon sculpture achieve it easily and today it is the best deal for the buck - to get this effect with any other means will cost more, sometimes a lot more. That is a perfect way to theme the party: if the a huge giraffe - you instantly know that the theme is "It's a jungle". It is a perfect way to create a focal point in the room: if you want your guests look in some direction, put a big balloon sculpture there. That is perfect way to decorate very large room on reasonable budget: if you decorate with some small object (say, flower arrangements), you need a lot of them to cover the whole space of the event. So, unless it is free, you spend a lot of money. Yes, the big sculpture cost more than little object, but you need only one! Then, since it is clearly seen from any point of the room, even the person in the furthest corner fills like he is sitting next to the stage. That creates very long lasting impression, together with memories of the gathering. The main reason for all of that is the fact that sculpture is so unusual (99% of people I have met so far had never seen anything like that) and so huge! A huge banquet facility took away all room partitions to create one big space for Valentine party. Several hundred people. 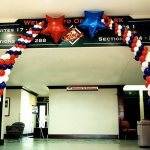 As always, very limited budget for decorations, what a surprise... We did two floor to the ceiling red balloon sculptures of hearts, to the right and to the left of the stage. Even in the room that big they looked very large and impressive - just judging by people's reactions when they enter the room. 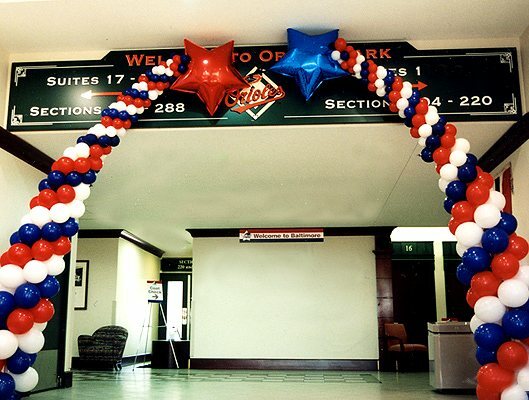 It is an interesting fact that would we put 3 balloons on weight on each table, it would cost more than hearts, look cheaper and nobody would remember the party. Another good example would be a joint Bar and But Mitzvah. 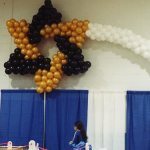 Here we can see how the big balloon sculpture works for the theme and for the "WOW!" factor. She is a jazz dancer, he is a saxophone player. So, as you can see on the pictures, we have made the sculpture of the word "JAZZ", 10' and the sculpture of floor to the ceiling saxophone (about 12' high). The wall behind the word "JAZZ" is lit from behind. Both sculptures, the word and the saxophone, are filled with balloon blinking lights. If we ever received that many thanks and prizes from adults and kids - I do not remember. And the king of the subject - monsters! This is not just my passion, these are my babies! Orange dinosaurs, blue dragon with wings and the Silver Monster. These creatures are not just focal point creators - they are attention grabbers! Orange dino was created for the first day of classes in school. No, they did not call us for the dino, they call to get an arch (just like most of our callers ). But the principal was a very bright gentlemen, definitely out-of­-the-box thinker, so when I made a suggestion, there was a blink in his eyes. He was jogging by 6 am of the day we have done the sculpture. He lost his gift of speech for a few minutes, literally. Then, it was his triumph. He was greeting every child at the entrance to the school and every kid and parent was WOWed! The blue dragon is actually Saphira, one of the heroes of "Eragon" the book in the Inheritance Cycle by Christopher Paolini. Christopher and several other authors were meeting with kids in Boston Public Library, so they need a decoration. The reading room where the meeting took place is humongous, no small decorations will be noticeable, so the dragon came naturally... It is 30' from nose to tail, each wing is 10' and the fact that it is standing on the selves is a completely different story. A scary one... See the pictures how Saphira was created, from the picture on a peace of paper to the sculpture. The Silver monster was created for summer camp where kids playin LARP game - some kids are really luck! In case you do not know what LARP is: live action role-playing game. To make the story short, kid are dressed and armed in warriors, magician, monsters, orks and God knows what else, they armed with everything there is out there (all made out of soft foam, but looks scary ), they go on adventures, they fight each other and so on. Who needs BIG monster more than them? The exclusive feature of this monster is that it is done by kids themselves under my supervision, not by our team. And another: it was suspended from the rope stretched between trees, it was not standing on the ground. So, when the gang came for the battle at night, there was a big (about 20' high) surprise for them - the monster! But they came armed with a catapult, so the monster was conquer.